Stash, New York's most creative graffiti artist.. or at least one of them.. has joined forces with Reebok once again to show off his talented and imaginative construction on two innovative Reebok models. This team did an extreme makeover on the ZPump Fusion and Instapump Fury Road models to bring you a vibrant, vivid, vivacious colorway! 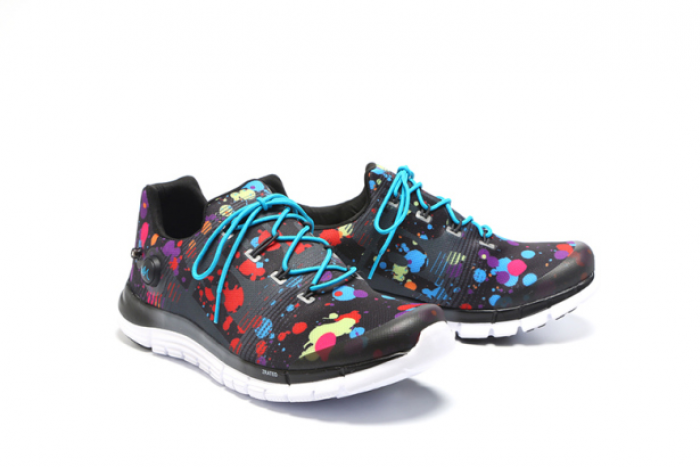 The inspiration behind the multi-color mottle graphic design stems from on the street culture within the city and brings in the comfort and stability needed for fitness enthusiasts who also have a love for sneakers. Each pair will feature the paint splatter effect along the entire sneaker canvas with dual colored midsoles made of contrasting Black and White. Both pairs feature Pump Technology which consists of an air filled sac which pumps up as needed and will mold to your foot for that locked-in custom fit. Also, among the ZPump silhouette, there is a lightweight fusion sleeve combined with a seamless compression sleeve that helps fuse the Pump Technology to your foot even more. Reebok built the outsoles involving ZRATED inspiration for ultimate high-performance control. All in all, Stash x Reebok have got you covered whether you wanna show off your newest pair in your collection or want to out run someone at the gym. Your choice. Stay flashy!